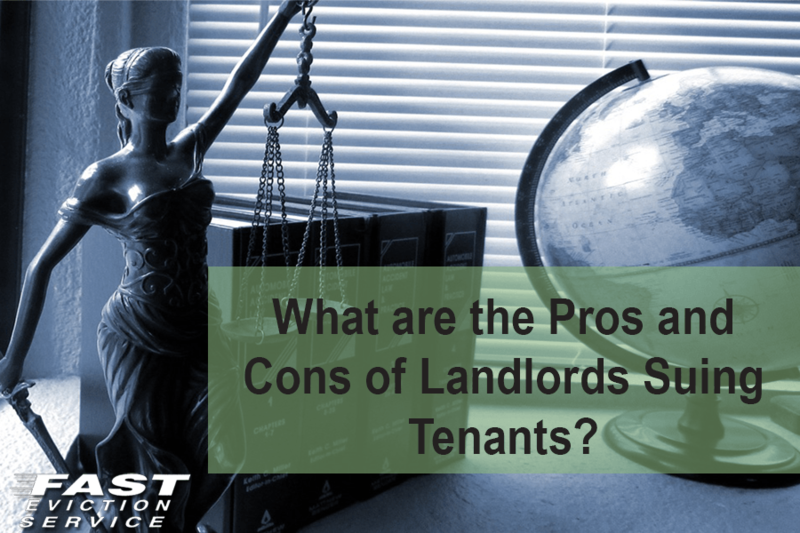 What are the Pros and Cons of Landlords Suing Tenants? You must have heard about tenants suing landlords for some reason or another but do you know there are certain situations when landlords also have the right to sue their tenants? Usually landlords or tenants take the matter to court when a conflict cannot be resolved in an amicable manner. So, if you are in such a situation, you can think about filing a lawsuit. There are some pros and cons associated with suing your tenants though, which will be discussed in this article along with reasons for suing your tenants. It is the right of a landlord to receive rent every month or as per the schedule determined in the lease agreement. If your tenant fails to pay the monthly rent then according to the law, you need to send a notice to the tenant asking him/her to pay rent. If the tenant does not pay attention, you can not only file a complaint to evict the tenant and sure them for the owed rent. In case there are outstanding utility bills in the tenant’s name while he/she is residing on your property then it is your right as the landlord to sue the tenant and recover the amount to be paid. Generally, the amount is deducted from the security deposit paid by the tenant but if the amount is higher than the deposited money then refer the matter to the small claims court and get the cost recovered. A landlord can sue a tenant if there is damage caused to your property. To compensate for the damage you can firstly deduct the amount from security deposit but if the amount is higher and doesn’t cover the damage cost then take the tenant to court and receive the remaining amount. If your tenant has made some alterations to your property without your approval then you can sue him/her to recover the money that is needed to restore the original condition of the unit. If the tenant owes you some amount that is higher than the security deposit and despite deducting there is still outstanding amount to be paid to you then consult small claims court to recover the remaining amount. If you have wrongly withheld the security deposit, it is the tenant’s right to sue the landlord. However, you can counter sue the tenant to show it to the court that all the deductions that you have made from the security deposit are legal. If the tenant has moved out of your rental property and the lease agreement hasn’t yet expired then the landlord can take them to court for recovering the amount that remains. In some states, landlords are allowed to seek compensation from a tenant who has moved out earlier than the lease agreement’s duration. The compensation would involve additional expenses such as marketing costs and utilities, etc., while searching for new tenants. For disposing off tenant’s abandoned property: Landlords can also sue tenants to recover costs involved in storing or disposing of their abandoned property. Using property for illegal means: Landlord can sue the tenant for damages if the tenant has used rental unit for illegal dealings. To keep a pet illegally: Every landlord has the right to either allow or prohibit tenants having pets so if you also have a pets policy and your tenant keep a pet without your consent or knowledge then you can sue them for breaching the lease agreement and also for damaged caused to the unity by the pet. Remember that if your tenant breaches any clause of the lease or causes financial, physical or emotional harm to you then it is your right to sue the tenant. What are the Benefits of a Landlord Suing a Tenant? It is quite possible that the dispute gets settled immediately as the tenant would want to avoid taking the matter to court. When the tenant receives a court summons it would serve as a warning sign for them as nobody wants to go through the hassle of fighting a lawsuit in which the tenant might very well be on the losing side. Hence, tenant would pay the amount or try to resolve the issue by giving in to your demand. Many times filing a lawsuit against your tenant is the only possible solution to recover owed money to the landlord. If the tenant claims that he/she isn’t responsible for the damages and would not pay the compensation amount then the court will make them legally obligated to do so. Only in the court can you expect receiving compensation for not just the money actually owed but for additional damages as well. For instance, if the tenant moves out early then you can sue him/her for due rent and for the costs associated with finding new tenant. A victory is a victory. If you win the lawsuit then it will serve as a proof that you were right and in the future if any tenant tries to create trouble for you or warn of suing you, you can easily tell him/her that you know the laws and have actually won cases in the past. RELATED: Our Eviction Court System – the Wild, Wild West! You may end up on the losing side is the biggest threat that a landlord has while suing tenant/ there cannot be a guarantee of victory and if your tenant wins the case, he/she may file a counterclaim against you. Filing a lawsuit and the entire prosecution process is not just time consuming but stressful too. No matter if you win or lose, the expenses will have to be paid for prosecuting your tenant. There will be court fee for filing the case, which is between $25 and $50. Depending upon the case, you will need an attorney and pay him the fees as well. Once you initiate a case in the court, your tenant would definitely get angry and he/she might even countersue you. If you lose the case, you will have to pay more to the tenant in attorney fees and damages. To sue or not to sue – that is the biggest dilemma for landlords. If you are also facing this dilemma, it is a good idea to consult an attorney and discuss your situation as well as your chances of winning the case. File the case if you are really sure that you have been wronged. Otherwise try to resolve the dispute out of court.